I’m an unabashed movie buff. And, one of my all-time favorites is Lawrence Kasdan’s “Grand Canyon,” built around the powerful story of two seemingly different men who meet under trying circumstances and wind up connecting as friends. There is one scene where a third character, a Hollywood producer, intones “all of life’s riddles are answered in the movies.” Nicely put, right? I think many of life’s riddles are answered in the garden, as well. And while I don’t usually pound the “garden as metaphor for life” drum, as I said in my last post I’m feeling a little Zen right now, so I’m going to indulge. Today’s riddle: How do you cope when you’re beat and the number of hours needed to complete your ever-growing to-do list are in inverse correlation to the number of hours available? Occasionally, when you’re too tired to water, you’re blessed with rain. Meaning, sometimes the planets align at exactly the right time, and an outside force intervenes to get you through the moment and lighten your load. 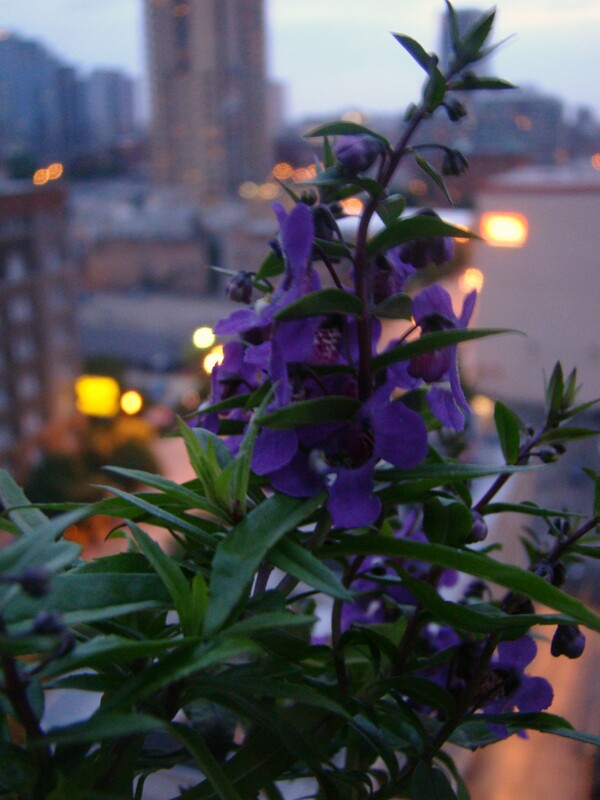 It’s at one of these times when you can just sit back and smell the roses — or, gaze upon your angelonia serena purple (pictured) at dusk.